Teardown analysis of both new iPhone models has revealed that the new Apple handsets cost less to produce than their rivals. 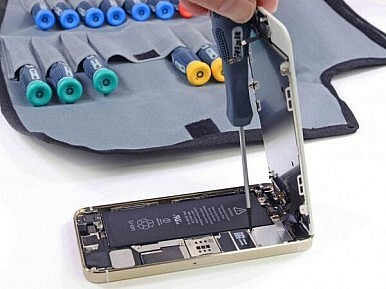 Research firm IHS dissected a gold iPhone 5s and a blue iPhone 5c to determine the “Bill of Materials” (BOM) for each. The IHS report was shared with All Things D a day before being released to the public. By adding the cost of individual components to the cost of assembly, IHS was able to determine that an iPhone 5s costs between $199 for the 16GB model and $218 for the 64GB variation. The plastic-backed iPhone 5c costs between $173 with 16GB of storage and $183 for the 64GB option. The iPhone 5s retails for $649 to $849, while the cost of an iPhone 5c ranges between $549 and $649. Surprisingly, even with a better processor and an integrated fingerprint sensor, the iPhone 5s costs less to make than the original iPhone 5 – which IHS pegged at $205 last year. “As with prior iPhones, parts associated with the display command more of that sum than anything else in the phone, amounting to a combined $41. IHS says the display likely comes from several vendors, including Sharp, Japan Display Inc. and LG Display,” said All Things D.
The iPhone 5c’s fingerprint sensor is said to cost $7. The 64-bit A7 processor, which is manufactured by arch rival Samsung, costs $19. The 5c’s A6 chip is also made by Samsung and runs $13. Assembly for the iPhone 5s costs $8, while the 5c is a dollar less at $7. Rival handsets from HTC, Samsung, and Motorola cost significantly more than Apple’s new iPhones. “[The final BOM] puts the iPhone 5C at almost $100 cheaper to manufacture than the HTC One by comparison, and is sold for the same price in many stores now. Even if Apple were selling as many phones as HTC they’d be making way more money per phone, especially when you consider patent licensing with companies like Microsoft, who pulls in $5 from every Android phone sold,” said Geek.com. According to Tech Radar, another IHS teardown of the Samsung Galaxy S4 revealed a $237 build cost for the basic 32GB model with a quad-core Snapdragon 600 CPU – with the octa-core Exynos-equipped variant costing $8 extra. The Moto X, even more colorful than the 5c, costs Motorola $221 per unit (16GB). “That figure includes $209 worth of components and another $12 in manufacturing costs. Since the Moto X is made to order in the United States, manufacturing costs are as much as $5 higher per unit than they would be if the phones were assembled in China. While $5 doesn’t seem like much, it adds up fast when dealing with huge volumes,” explained BGR. Apple has once again managed to set the bar as far as profit margins are concerned – but it is only a matter of time before the next Foxconn scandal reminds the world about the human cost of cheap electronics. A riot that broke out yesterday at a plant owned by Foxconn, the world’s largest Apple supplier, was apparently not associated with iPhone production.